Minced seasoned chicken in a breadcrumb and tortilla crumb coating. 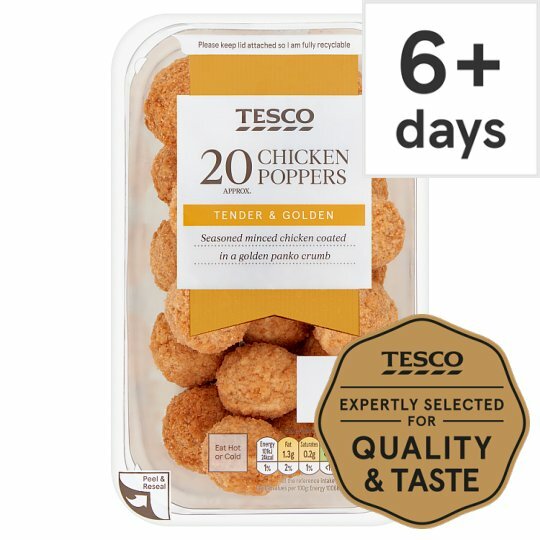 Chicken (49%), Wheat Flour (Wheat Flour, Calcium Carbonate, Iron, Niacin, Thiamin), Water, Rapeseed Oil, Onion, Maize Starch, Salt, Chicken Fat, Yeast, Garlic Purée, White Pepper, Turmeric Extract, Paprika Extract, Sugar, Stabiliser (Calcium Carbonate), Emulsifier (Mono- and Di-Glycerides of Fatty Acids). Instructions: 180°C/Fan 160°C/Gas 4 10-12 mins Can be eaten hot or cold. If heating, place on a baking tray in the centre of a pre-heated oven.